Reverend Dr. Alyn E. Waller is the Senior Pastor of Enon Tabernacle Baptist Church in Philadelphia, Pennsylvania. He is the overseer of Enon Music Group (EMG). Pastor Waller is passionate about spreading the Word in righteousness, be it from the pulpit or through song. EMG is a Christian Label filled with a diverse group of artists whose heart for Jesus is in every lyric. From battle cry, singing hymns, jazz and worship; EMG is a label to watch. 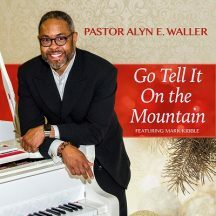 Pastor Waller latest project titled Go Tell It On The Mountain, featuring Mark Kibble, is an example of style and grace coming from Enon Music Group. @ copyright URBAN BUZZ MAGAZINE WHERE KEYPLAYERS SPEAK.